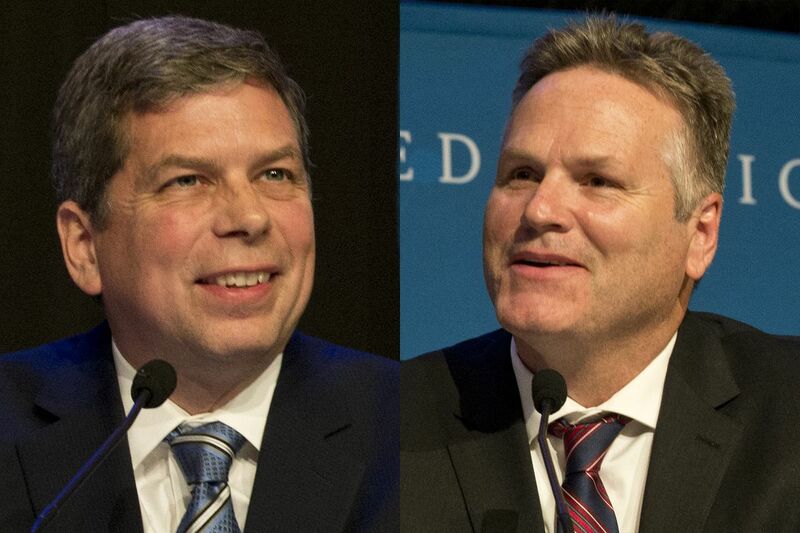 The two major candidates for Alaska's governor have starkly different plans for the Alaska Permanent Fund and residents' annual dividends. On one side: Republican Mike Dunleavy, a former state senator from Wasilla, says he wants to pay full dividends under the formula in state law that lawmakers have traditionally used. He also wants to pay Alaskans back for three years of dividends he says they're owed. On the other: Democrat Mark Begich, a former U.S. senator and Anchorage mayor, says he supports a constitutional amendment to limit the Legislature's annual withdrawals from the fund. He wants to spend half of the money drawn on dividend checks and the other half on public education, including pre-kindergarten. While the governor's race has recently transformed from a three-way campaign to a two-way fight, the issue of Alaska's oil-wealth checks has been a key topic for all of the candidates for months. So how do Begich and Dunleavy want to calculate dividends? How would Alaska afford their proposals? Here are the basics of the candidates' dividend plans and what state finance experts have to say about them. To calculate the size of residents' dividend checks, Alaska lawmakers have long stuck to using a formula in state law that's tied to investment returns. At least up until recently. Faced with a multibillion-dollar budget gap driven by low oil prices and dwindling oil production, Gov. Bill Walker vetoed a portion of the dividends in 2016. The Alaska Supreme Court later upheld the veto. State legislators ignored the dividend formula the next two years, capping dividends at $1,100 in 2017 and $1,600 in 2018. The Legislature also passed a bill earlier this year that, for the first time, set up a framework to start paying for government services with some of the Permanent Fund's investment earnings. The bill caps the Legislature's annual withdrawals from the fund at 5.25 percent of its market value. The bill doesn't directly affect the size of dividends. The Legislature decided this year to put $1.7 billion of the money drawn from the fund to plug the state's $2.5 billion budget deficit, and use the rest — $1 billion — for the $1,600 dividends. Under the dividend calculation in state law, the checks would've been larger. 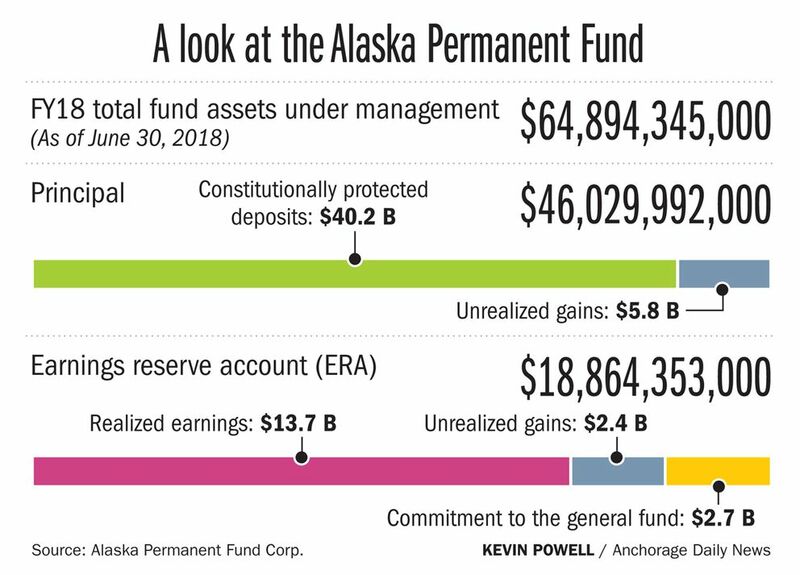 Begich said in a recent debate that he supports an annual draw from the Permanent Fund of 4 percent of its market value, describing that as "a better percentage over the long haul." But, he said, he doesn't want the Legislature debating the size of dividend checks each year. "When you leave it in the hands of politicians, they will make decisions that are not necessarily always in the best interest of the community at large," he said. Begich wants to put half of the money drawn from the fund each year toward dividends and the other half toward public education. He wants to inflation-proof the fund. He also said he wants his plan enshrined in the Alaska Constitution by a public vote. "If you want to protect the dividend and protect education, that's the plan that I propose," he said. Dunleavy wants to use the formula in state law that lawmakers have traditionally used to calculate dividends. "I want to follow the law," Dunleavy said at a recent debate in Fairbanks. Under that formula, Dunleavy estimated this year's checks would be nearly $3,000. Dunleavy said the problem is not the dividend, but spending. "The issue was never with the PFD," he said at a recent debate. "The PFD worked for years. It's spending. And I believe we have to cap our spending, especially our operating budget." Dunleavy said in an email sent through his campaign spokesman that he supports inflation-proofing the Permanent Fund. He said no change should be made to the structure of the dividend without direct input from Alaskans, either in the form of an advisory vote or a constitutional amendment. He also supports putting the dividend formula currently in state law in the Alaska Constitution. "I believe the Permanent Fund belongs to the people of Alaska and support protecting the PFD in the Alaska Constitution where politicians can't touch it," he said. To put an advisory vote on the ballot, Alaska legislators would have to pass a bill, with a simple majority, calling for one. The public can only provide advice in that vote and the Legislature can choose whether or not to follow that advice, according to the state's Manual of Legislative Drafting. To amend the Alaska Constitution, both the state House and state Senate must approve the proposed amendment by a two-thirds vote, then the question would be put to voters during the next general election. If a majority of voters approve the amendment, it's adopted. Begich said in an interview he would support putting the question to voters — about the 4 percent annual draw and splitting the payout between dividends and education — on a special election mail-in ballot in 2019, before the 2020 general election. Asked if that was possible, Cori Mills, Alaska Department of Law spokeswoman, said in an email: "I don't have a definitive answer for you. That particular question is not one we have looked at or have case law on to my knowledge." Dunleavy would pay Alaskans' dividends — including the money he says they're owed from recent years of lower PFDs — using the Permanent Fund's earnings reserve account, said campaign spokesman Daniel McDonald. When the dividend was capped in 2016 and 2017, the money that didn't get put into the checks stayed in the earnings reserve. The account grew from about $6.2 billion in 2014 to about $18.9 billion four years later, according to the Alaska Permanent Fund Corp.
"The money is available," McDonald said. "It's just a matter of: What kind of budget do you want to have going forward? And I think, you look at Dunleavy, he wants, he's probably going to exercise the power of the veto a lot more, he wants to reduce the budget." The Alaska Permanent Fund totaled nearly $65 billion on June 30, according to the Alaska Permanent Fund Corp.'s annual report. About $46 billion of that money was in the principal, an account that, under to the state Constitution, can be invested, but not spent. The rest, about $18.9 billion, was in the earnings reserve account — $2.7 billion of that committed to 2018 dividends and government services, the report said. Legislators can vote to spend the money in the earnings reserve. To retroactively pay the full dividend for the past three years, each eligible Alaskan would get an additional $3,360, according to estimates from the Legislative Finance Division. Dunleavy estimated the number is closer to $3,733. Multiply the totals by 640,000 — the estimated number of people who got the PFD this year — and a retroactive payout could cost between roughly $2.2 billion and $2.4 billion. Walker and Begich have both criticized and questioned Dunleavy's PFD plan. "They're going to dwindle it down to pay off their campaign promises and the end result is, we all will pay this price in a decade to come," Begich said at a recent Anchorage debate. About Begich's plan, Dunleavy said at the recent Fairbanks debate: "The proposal you put forth cuts the PFD. … This is an issue of trust." Begich wants to put $14 billion from the earnings reserve into the principal of the Permanent Fund account so lawmakers can't spend it like they did in recent years with the once-massive state savings account, the Constitutional Budget Reserve, he said. "I don't have a lot of faith they'll protect that sum of money," Begich said about the billions of dollars in the earnings reserve. Begich's plan would result in a dividend that today would be estimated at more than $2,000 for each eligible Alaskan, according to his campaign website. He said at a recent debate that it would mean dividends of about $2,100 this year. The plan would also free up funds previously used for education — as much as $1.3 billion this year, the campaign website says. In the state's current operating budget, lawmakers allocated about $1.2 billion to public schools under the foundation formula — the per-student calculation amount that the state gives to school districts. It's impossible to talk about the dividends without talking about a budget plan, said Ed King, economist and owner of King Economics Group based in Juneau. "One way or another you have to balance the budget," he said. The Permanent Fund earnings reserve grew in recent years. Meantime, the Legislature drained billions of dollars from the Constitutional Budget Reserve to cover budget deficits after oil prices crashed. "We squeezed one end of the balloon and the air rushed to the other part," King said. Having access to the billions of dollars in the earnings reserve account provides a "safety net" in times of a budget shortfall to pay for government services, but "that net also might encourage you to take more risk," King said. "There is kind of a give and take," he said. Larry Persily, a former Alaska Department of Revenue deputy commissioner, said the Legislature will have to tap into the Permanent Fund earnings reserve to pay for government services next year. "I cannot conceive of any time in the foreseeable, plausible future where Alaskans will not need to use some portion of Permanent Fund earnings to pay for education, troopers and other public services that we have enjoyed tax-free for two generations," Persily said. "I think it is a mathematical impossibility." David Teal, director of the Legislative Finance Division, also said "there is virtually no way oil prices are going to be high enough to generate another $2.5 billion" for the next budget. "You'd have to have oil prices in the $100 range to do that," he said. Persily said the question becomes: How do you spend the earnings reserve between public services and dividends? "You probably cannot afford to pay $3,000 dividends forever," he said. "So you're going to have to figure something out that is politically sellable to the public and to the Legislature." Dunleavy's campaign refused repeated requests for an interview with the candidate about his Permanent Fund plan over several days this month. Dunleavy also didn't attend a recent Anchorage debate that focused on the candidates' plans for the fund and the dividend checks. McDonald said the candidate would answer questions by email. In an email sent through McDonald, Dunleavy said he supports paying full dividends under the formula in state law and what remains in the earnings reserve "can be part of our budget solution only if we reduce our budget to a sustainable level and put limits on future spending growth." Paying dividends this year under the formula in law would have cost about $900 million more, according to an August report from the Legislative Finance Division. Paying $2,100 dividends would have cost $300 million more, according to the division. Dunleavy said at the recent Fairbanks debate that he would not support various types of taxes, including a sales tax, income tax and payroll tax. He does support cutting the budget. He said he would prioritize spending on public safety, education, transportation, and natural resources management. After that, "some of the other things will have to be up for negotiation," he said. "During this year and then going into the summer, we're going to take this budget apart piece by piece," Dunleavy said. Later at that Fairbanks debate, on the budget, Dunleavy said: "If there's a fast-rail study that comes up from the Legislature, I'm not going to allow that to get through and go into the earnings reserve to pay for that. If it's a climatologist, if it's any kind of crazy study, it's not going to happen." At a debate at the Alaska Federation of Natives convention, Begich said he was not looking at additional cuts to state departments. The state budget "has come down to an incredibly low amount," he said. "The question is: What are we going to do and how are we going to invest? How do we make the government more efficient?" he said. At another recent debate, Begich said "there's no question" Alaska will need revenues. "What that will be?" he said. "I wouldn't have any heartburn over if it's an income tax, sales tax, other corporate type of taxes — it's going to be a mixture. But the most important thing is, when you do this, you have to do it one time and be done because if you debate this every single year, you never get on with doing the big things that we need to do as a state." At the Fairbanks debate, Begich said he would support an income tax and sales tax, adding that it "depends if it's seasonal." With both candidates talking about going back to Alaskans for a vote, the dividend issue won't be close to over after Election Day, Persily said. In 1999, there was an advisory vote on the ballot asking Alaskans if — after paying annual dividends and inflation-proofing the Permanent Fund — they supported using a portion of the fund's investment earnings to help balance the state budget. About 83 percent of voters said no. "Speaking as a long-term cynic and skeptic, I do worry — not that the public doesn't have the right to vote — but I do worry about the public's ability today to vote in the best interest of tomorrow," Persily said. He added: "But, come on, what else would we do in Alaska if we aren't fighting over the dividend?" Reporter Annie Zak contributed to this story.